L 14-15 cm. Breeds in caves and cavities on cliff faces, rarely also in holes in buildings and walls. Found at all levels, even high up (>2000 m) in remote mountain areas. Migrant in N, resident or shortdistance migrant in S.
IDENTIFICATION: Large and compact swallow with heavy body, broad neck and broad but pointed wings. Drab grey-brown above with flightfeathers a shade darker, and dirty brown-tinged greyish-white below on breast and gradually darkening rearwards towards undertail-coverts. At moderate range in good light, throat appears faintly streaked or dusky. Underwing pattern characteristic, with rather pale brown-grey remiges and clearly contrasting sooty-black coverts. An important character visible only when shallowly forked tail is spread: small white ‘windows’ on most tailfeathers. Flight powerful and agile, often glides on flat wings held straight out, twists and turns, sweeps rapidly along, gives a few quick beats, and so on. Often seen high up in air like a swift, or patrolling back and forth along vertical cliff high in mountains. 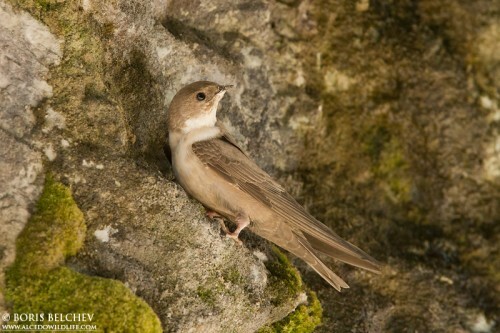 - Juvenile: Same plumage differences as for Sand Martin. VOICE: Rather discreet repertoire. Calls often heard include a short, high, clicking ‘pli’, a cheerful Linnet-like ‘piieh’, also short, chirpy, somewhat House Martin-like ‘tshir’ and ‘trit’. Song consists of a quiet, fast, twittering series.